I have been experimenting with a printmaking technique called Drypoint. Instead of working on a traditional metal etching plate, I've scratched a piece of plastic with the tip of a scalpel to create the image. When intaglio ink is spread onto the plate and rubbed away with a piece of tissue paper, the scratches retain the ink. 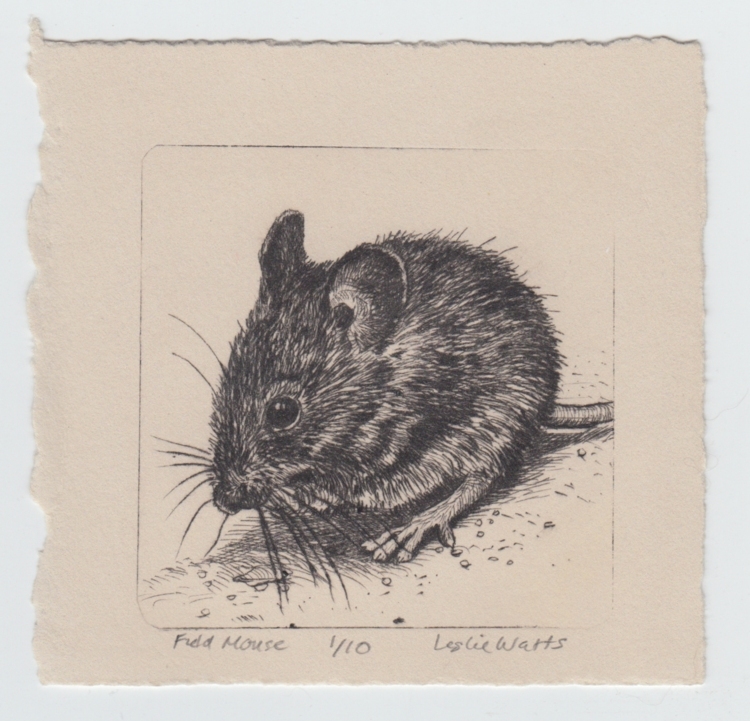 Field Mouse, plate size 3 x 3"
That's a beautiful artwork however arrived at! I did this years ago. Now I want to try it again. Thank you! I certainly want to do more. It's a lot of fun. So cool! What sort of plastic did you use? It was the lid from a clear plastic salad container. It's the same kind of plastic that things at the hardware store are sealed up in. It's somewhat rigid, but flexible enough to bend when it reaches the bottom of the pasta maker so I can pull the print right through. I think a lot of drypoint printers use rigid plexiglass, but that wouldn't work here unless you were making a very tiny print on the pasta maker, since it wouldn't make it past the base of the machine. Inspiring. Will be giving this a try. This is absolutely amazing. I would never have imagined this came from a pasta maker and plastic salad container lid! fantastic! I love the innovation of this concept. Brava! Inspiring. This is brilliant! I'm going to try some old overhead projector acetate. 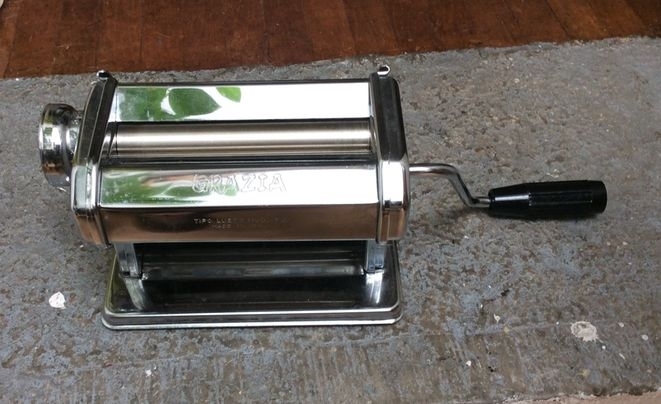 Do you have to modify the pasta machine at all? Would you mind posting an image of the "plate"? I'm so intrigued! This is exciting! Amazing. 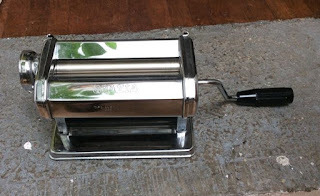 I've never used a pasta maker before. I'm guessing that you have the ability to remove any of the cutting blades in this model. Can you also adjust the pressure at all? Or do you just add more paper/cardboard for increased pressure? This is an amazingly detailed and crisp print. None of the fuzzy edges and such defined lines. I am amazed! Looks like a "real" etching to me. Absolutely stunning! - And now I want to try a paste-machine, too. I have been making rhenalon drypoints just with a copy press. Worked well enough for my much simpler prints, but it seems worthwhile to investigate other simple presses. @ Ordinary Robot and Jim: I didn't modify the machine, although I removed the cutting and ravioli attachments. I have it set at the second highest pressure (5 of 6) although I'd adjust it if using thicker paper or any kind of soft backing layer behind the print paper. I think what works best is a tight squeeze, though not so tight that the plate becomes deformed by the pressure. Just experiment! @ Pete Nawara: I'm presently uploading a video of the process which should give you the information you need about the plate. I've discovered that I can use any plastic that will hold a scratch, including the inside of a mylar dog food bag. But the transparent PET plastic used to package food (such as salads or berries) is my favourite surface. @ Hilke: I think the lines are fine because I'm actually scratching into the plastic without raising much of a burr. I found that with a softer plastic, such as the white plastic lid of a yogourt container, it's possible to create a burr that more closely resembles traditional drypoint on metal. Thanks, everyone, for your kind comments. 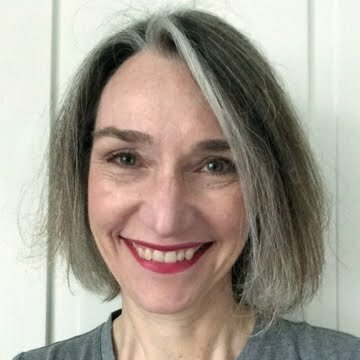 I'm surprised and delighted by the response I've had to this process on Twitter, and I hope that many more people will try it out. If you're patient, and willing to make mistakes, you can make a lot of test runs before you create an image that's worth printing in multiples. Most of the work shown here is available at Village Studios, 24 Downie Street, Stratford, Ontario. Prices range from mid-hundreds to low thousands (Canadian dollars). To inquire about purchasing and/or shipping, please call Village Studios at 519-271-7231. Or email villagestudios@wightman.ca.